While the exodus from Kathmandu to the Khumbu continues, the migration to Chinese Base Camp on the Tibet side is now in full swing. Some teams are acclimatizing on the 6,096-meters/20,000-foot Lobuche East peak on the Nepal side. A quick rundown on who is where. For a complete list see the Tracker Table. More teams are posting updates like from Summit Climb that just spent 10 hours on the road from Kathmandu to Kirong, Tibet aka Gyirong, Xigaze, Tibet, China. Before the 2015 earthquake in Nepal, Zhangmu was the border crossing between Nepal but was damaged in the earthquake, now Kyirong is officially crossing station open for both local and foreigners. FYI: Most teams take the $200 flight to Lhasa avoiding this ordeal. Each Sherpa has now been allocated their climbing kit including new Berghaus down jackets and La Sportiva mons high altitude boots. Sherpas from Russia’s 7 Summits Club are already at CBC establishing their lavish base camp. Adventure Peaks flew from the UK to Lhasa by way of Chengdu, China for their north side annual expedition. Arnold Coster/Seven Summits Treks team has left Kathmandu for Lhasa as has Furtenbach Adventures, and Transcend Adventures. I have loved learning about the Nepali and Sherpa cultures so much that I find myself being an onlooker quite frequently. The mountains are special, but the people will be my favorite memories. Cory’s second episode produced by Roam is now available. It’s becoming very clear that this effort is much more than just a climb, and maybe the most interesting story on Everest this year. You read it over and over that the Khumbu Icefall is a death trap and should be avoided at all costs. Certainly the North side operators promote this narrative. I made an extensive post a couple of years ago using facts, not the self-interested marketing that surrounds the Icefall and the danger. That said, to be clear, the Icefall IS dangerous. In 2017 Kami and I were climbing to Camp 1. Around sunrise, 5:30 am, we heard a huge crash just behind was. A 6-meter/20-foot serac collapsed directly into the route that we were on several minutes earlier. Yes, the danger is high, but the hype is higher. George Mallory while seeking a route to climb to the summit of Everest is said to have sighted the Icefall in the early 1920s and said it was “terribly steep and broken … all in all the approach to the mountain from Tibet is easier” thus shifted his efforts to Tibet. This is probably represents the high end of the possible risk range. 36 / 180000 = .0002 (or 1 death per 5000 trips). So I would estimate the risk of death per passage from avalanche or icefall collapse to be in the range from 1/2000 to 1/5000. Limit the amount luxury gear you have at Camp 1 and above. For example on Denali you never have tables and chairs and huge dining tent, so why on Everest? Support transporting all fixed line gear by helicopter to Camp 2 thus reducing the Sherpas trips carrying the loads, even if means spending a bit more money for permits, etc. Minimize how much supplemental oxygen you use, go with a safe amount but don’t over do it by buying the “extra, unlimited bottles” offered by some guides. 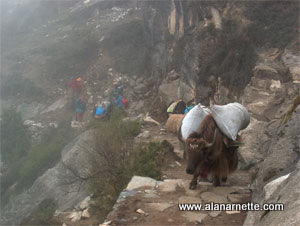 Each bottle is carried on the back of a Sherpa and that means extra trips through the Icefall. A strategy long adopted by International Mountain Guides, Himex and others is to eliminate at least one entire trip through the Icefall by climbing the trekking peak Lobuche East at 6,096-meters/20,000-foot. It’s a days walk from EBC. Team 1 recorded 25 summits this morning under perfect conditions on Lobuche Peak! The team woke up at 3:30am and was climbing by 4:30. With our new High Camp on Lobuche, our team received the benefit of sleeping higher for acclimatization (18,300ft) and then starting the climb a bit later. This was my narrative from 2011 when I climbed with IMG and Kami Sherpa on Lobuche and then on to the summit of Everest on my fourth attempt. A familiar sound – the ignition of the stoves – after the moon had set and the night was at the coldest and darkest. I rolled over in my sleeping bag. I heard the breathing of my tent mate, the sounds inside the tent a few feet away. The snow had stooped. I pulled my Buff away from my mouth; it was soaked. My sinus had made an executive decision for the rest of my body and was sending a series of liquid orders demanding attention. Following orders, there my throat had constricted leaving a raw residue that refused to cooperate with my breathing or talking. In a voice more similar to a life time smoker than a climber, I woke my tent mate; “Bill, sounds like the Sherpas are up. Time to go.” “Alan, it is 2:30, we don’t get up until 3:30” he said as he now rolled over, back to me. I stretched my legs out letting my toes touch the water bottle that had completed its job; the hot water now tepid. I wiped my nose. People often ask me what it is like, or why, Everest a 4th time. All I can say is that I am lucky; honored. As I snoozed off and on, I heard steps approaching our tent on the newly fallen snow at 17,000 at Lobuche High Camp. Kami called out my name as he unzipped the tent door. What follows would be, no is; total coddling. He made me a hot cup of black tea; coffee for Bill. We sipped it while sitting upright in our down sleeping bags. A few minutes later he reappeared with a plate holding two pieces of toast and a fried egg. He made more tea. Climbing in the Himalaya is different from any place on Earth. While you are expected to be experienced, self sufficient and skilled; you are taken care of by the Sherpa community like a new born who knows nothing. My teammates had gathered outside their tents; their headlamps looking like a group of midges in the cold dark night. I joined them putting a few last things in my pack. Kami picked it up. “Too heavy” as he put my spare jacket and bibs in his pack. I knew it would do no good to argue. My memories of nights identical to this at the South Col took over. But this new memories was 9,000 lower. A good memory. Once again, I thought about memories the role they play in our lives. Memories provide context, a sense of substance. Memories are who we are. One teammate left with her Sherpa into the darkness and soon we all took our place in line as the route took us through rock bands, close to a cold and harsh stone wall. The ground was now covered by the eons of erosion; finely ground sand. Breaking out of the rocks, we leveled for a short time and then regained the elevator angle, now snow covered slope. This continued for 2 more hours. The sun started to break through sending the stars to the other side of the earth for the next 12 hours. We saw the morning rays on the highest mountain peaks long before we saw it on ourselves. We were climbing in the high altitude of the Himalaya. Yes I am lucky; honored. The angle picked up as we put on crampons and clipped our metal carabiners and jumars onto the fixed ropes the Sherpas had only set the previous day. The sun now broke though and warmed the morning. The summit of Lobuche Peak, the East summit at 20,000′ was starting to come into view as we stepped onto the glacier. Our team had split into several groups. No one was racing, just the natural pace of climbers. Greg, standing on a rock prow like a pirate boat skipper, called out words of encouragement, coaching, an occasional question to his charges as we made steady progress. The chatter over the radio from the Sherpas verified all was fine, all was in control. This acclimatization climb was right on schedule, right on pace, everyone was looking good. I slowed as we reached 19,000′. It was high, the oxygen a bit thinner. Kami let me set the pace, he was following, probably bored. But I felt his eyes watching my every move. I said little with my throat raw; my Buff once again soaked. The angle picked up to nearly 50 degrees for a short stretch. Perfect time to practice cramponing techniques. The snow was solid; easy traveling, except for the 19,000′. “Summit”, Kami said in his gentle voice pointing towards the skyline marking blue from white. And with that we stepped on the East Summit. The clouds covered the view but for an occasional brief break. I took as many pictures as I could. I gave Kami a bag of honey chews for a snack as I ate the same. He immediately walked over to another Sherpa to share. I glanced at my watch. Hmm, 4 hours and 3,000′ gain. Not bad to 20,000′. I looked around with increased self confidence as Kami looked at his chewy. Everest came into view, then Ama Dablam; Maklu made an appearance. Lucky, honored. As always Alan, thx for the update… Enjoying Cory Richard’s ‘The Line’ videos as well… Is it literally just (an I say ‘just’ very loosely) the start of the NE ridge climb that theyre doing differntly…? It seems as though they plan to join the NE ridge route after the initial climb?? ?